The courage this youngster showed is something all of us can learn from. 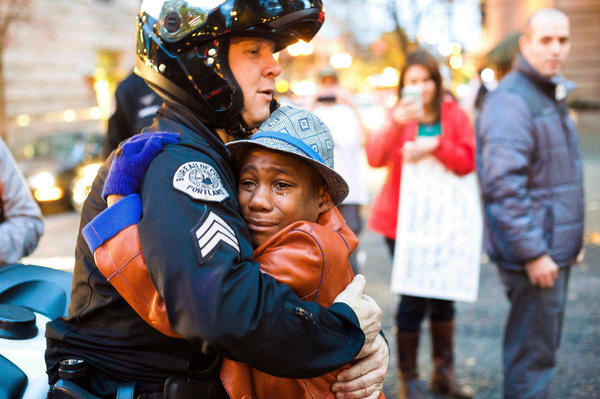 A photographer captured this moment as a Portland police officer on duty behind a police barricade during a Ferguson protest motioned for the little boy to come closer. The boy was holding a sign that read “Free Hugs.” Trembling and with tears streaming down his cheeks, the boy approached Officer Barnum who then asked the boy if he could have a hug and the two embraced. The photo has drawn national attention. 12 year old Devonte Hart went with his family to downtown Portland following the grand jury’s decision not to indict Officer Darren Wilson in the shooting death of Michael Brown. According to his mom, they went “with the intention spreading love and kindness.” Devonte’s mom earlier had written in a Facebook post that Devonte has been struggling with fears of police officers and issues with police brutality and racism.